The Atavism: Sunday Spinelessness - The end of Drosophila melanogaster? 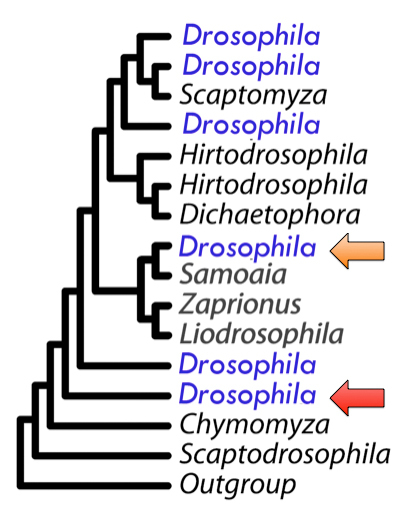 Sunday Spinelessness - The end of Drosophila melanogaster? It looks like Drosophila melanogaster, the subject of a recent Sunday Spinelessness post, is about to be lost the world. The species itself isn't under threat of extinction, you can still have them delivered to your door, it's the name that looks set to go the way of the Brontosaurus. One of the goals of taxonomy is to give scientists a precise set of terms that refer to a mutually understood group of organisms. The name D. melanogaster is a case in point, geneticists frequently refer to that species as "the fruit fly" but the common name "fruit fly" could equally be applied to the whole genus Drosophila (more than 1400 species), the family Drosophilidae (containing another 50 or so genera) or the related family Tephritidae. Believe it or not, the lack of precision conveyed by the term fruit fly became part of the USA's 2008 presidential election. Sarah Palin made some snide and ignorant remarks about "fruit fly research" in one of her speeches which were interpreted by scientific types all over the world as a swipe at basic research. People wrote pieces on the importance of D. melanogaster research in understanding human disease and media picked up the story. But Palin wasn't talking about Drosophila, she was referring to a project on an economically important Tephritid. She was still being ignorant and playing the "aren't those scientists stupid" card, be she was doing it about a project that stood to help a multi-million dollar industry that employs thousands of people. When we say D. melanogaster instead of fruit fly we all know what we're talking about, and in modern biology a species name can be a key to huge amounts of information. But there's a problem with Drosophila. The genus as it is currently prescribed is a mess, species currently included in the genus come out in disparate groups in phylogenetic analyses like the one one the left. The solution is obvious, break up the big malformed genus into a set of smaller ones, giving all but one a new name. Such a process is pretty common in taxonomy, and the code used to my animal taxonomists explains how to go about doing it. Each genus has a "type species" which acts as the name bearer and when a genus is split, it's the group with the type species that keeps the original name. In molecular biology D. melanogaster is very much the name bearing Drosophila (it's frequently referred to just by that name or even as "the fly") but the same isn't true in taxonomy. The type species is D. funebris and no matter how Drosophila is broken up D. funebris and D. melanogaster are going to end up in different genera so melanogaster will lose its forename. But D. melongaster isn't just any fly - changing that name would render thousands of textbooks, papers and databases out of date. This photo was taken on Mitiaro in the Cook Islands, and at the time I took I knew for sure that those white striped legs marked it out as Aedes aegypti. If that species of mosquito had bitten me on any other island in the Cooks I wouldn't have calmly framed a photo, it's a vector for dengue fever which is, by all accounts, a horrible disease to have (Mitiaro's population of 200 people isn't enough to sustain Dengue, and since the main features of the island are two huge brackish lakes fill of mosquito larvae you soon give up on swatting bugs and spraying DEET). But the point of me showing you this photo now is to tell you that mosquito is no longer Aedes aegypti. Some ICZN committee members cited the fact this species has recently been renamed to Stegomyia aegypti as evidence that renaming a widely studied organism isn't the end of the world, which rather ignores that fact medical workers, ecologists, parasitologists and geneticists have ignored the reassignment entirely and some prominent journals have even issued editorials encouraging researchers to use the "old" name. 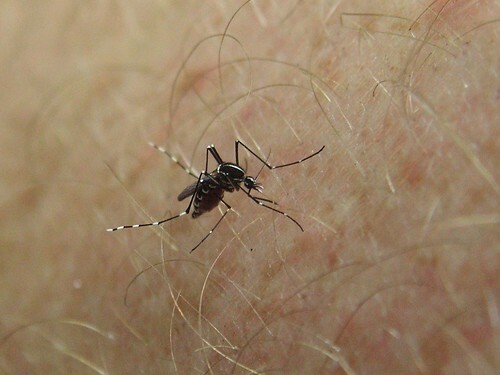 Surely in Aedes aegypti we have a model of what will happen when D. melnoagster gets its genus reassignment - taxonomists will refer to it by the new name and the rest of the world will cray on as if nothing had happened. By refusing to make a small change to the existing taxonomy of the group the ICZN runs the risk of driving a gap between the taxonomic community and other scientists. The only good thing to come from the whole ordeal is that "D. melanogaster" will almost certainly become Sophophora melanogaster which tranlates as "dark bodied bearer of knowledge", a fitting name for such an important fly. Plenty of other bloggers have been talking about this story, some with quite different takes than mine. You should check out Kim van der Linde who made the the application to the ICZN and has been blogging the aftermarth as well as Micheal at Arthropoda, Chris at Catalogue of Organisms and Dave at Seed.